Bacon as a Service? – Pick Cloud, Inc.
BlogHome Google Cloud, MultiValue, Technology Bacon as a Service? Sounds ridiculous right? But if you think about it, it really isn’t all that different than cloud computing. Why pay for the whole pig when all you really need is the bacon? Or in other words, why pay for a hefty server when you may only be utilizing a small portion of it (the bacon.) You still have all that meaty goodness, but don’t have to pay for all the fat you don’t need. One of the reasons we went into the cloud business is we saw that clients were spending thousands of dollars in advance for a server and configuration they thought they would need in the future when they could have been spending a fraction of the cost for what they needed right now. The great thing about the cloud is that you can increase resources quickly when you need them and reduce them when you don’t. AND you are only paying for what you use when you use it. The other thing about the cloud is the infrastructure and security that comes with it. It’s not just someone else’s computer. 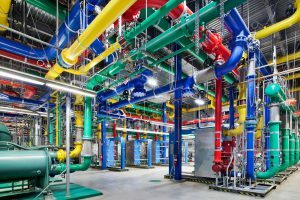 At Google, data is automatically secured at rest and in transit. You can use your own keys or Google’s. You have access to the same infrastructure as Google uses for YouTube, Gmail and their search engine. AND all of this is available on Linux and Windows. AIX is coming soon. You can have the best infrastructure money can buy without buying any of it. It is compatible with all flavors of PICK, including Rocket Software and OpenQM and with Google available pretty much all over the globe. We offer a wide selection of software-as-a-service products as well as packages to fit every budget. Some, like our starter pack, includes hosting, printing and reporting! If you aren’t ready to commit to the whole enchilada, you can start with your backups. Lastly, software as a service provides companies access to products at a fraction of the cost they would normally pay. Sometimes the on-premise price can be out of some customers reach. With the cloud, they can pay a small monthly fee. Don’t just take our word for it – try it FREE for 15 days with no credit card or commitment required. That is how much we believe in it and once you try it, we think you will too. What is the True Cost of Being On-Premise? Subscribe to learn pretty cool things about MultiValue and Google Cloud. Don't forget to follow us on our social media profiles and keep up to date with our latest news.